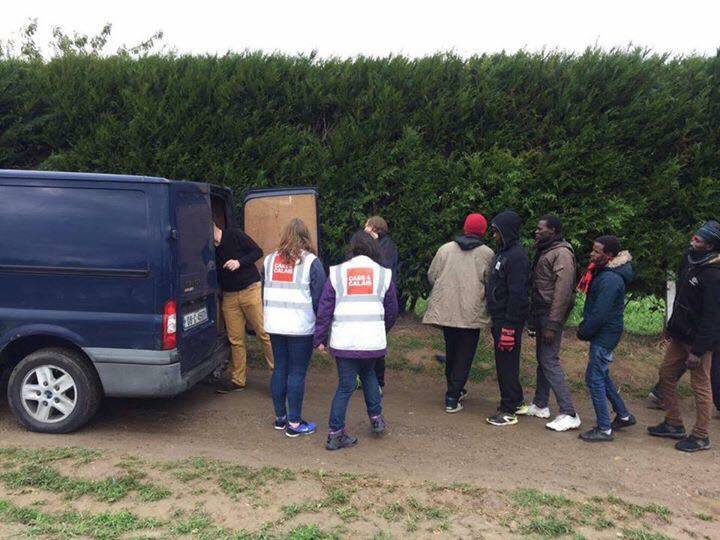 Last night I had a call with a new French group set up to help around 200 refugees sleeping rough in a port town near to Cean. This week we sent them another van full of sleeping bags and tents. This group formed to provide the refugees there with food twice a week. They were shocked to find people in their home town sleeping rough outside in this cold, wet weather. However they are now facing opposition from some of their neighbours. The local mayor has suggested that, by providing the food, they have encouraged more people to arrive. As numbers are increasing they are worried he might be right and are unsure what to do. As we have been providing aid for a long time they wanted our advice. I told them that, in Calais, the local mayor has tried many strategies to stop the refugees coming. These include banning food distributions, harsh police treatment and confiscating bedding, shoes and other possessions. I mentioned the recent Human Rights Watch report on police violence in Calais. None of these things have stopped people coming to Calais. I told them that, in my experience, the things the refugees are running from – war, persecution, torture and terror – are all so much bigger factors, that to give or not give a meal is a small thing in comparison. It is an act of compassion and matters because it shows we care; but not because they travel 3,000 miles for it. I thanked them from the bottom of my heart for helping our friends in need and wished them good luck and courage. Unfortunately my experience of the last two years is that they are going to need it.